فهیمی, سارا, احمدی گیوی, فرهنگ, مزرعه فراهانی, مجید. (773). بررسی اقلیم‌شناختی بندال‌‌های آسیا و اروپا با دو شاخص در دوره 1950- 2010. 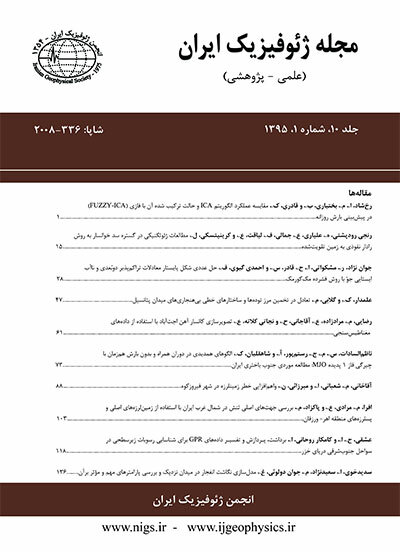 مجله ژئوفیزیک ایران, 7(4), 31-51. سارا فهیمی; فرهنگ احمدی گیوی; مجید مزرعه فراهانی. "بررسی اقلیم‌شناختی بندال‌‌های آسیا و اروپا با دو شاخص در دوره 1950- 2010". مجله ژئوفیزیک ایران, 7, 4, 773, 31-51. فهیمی, سارا, احمدی گیوی, فرهنگ, مزرعه فراهانی, مجید. (773). 'بررسی اقلیم‌شناختی بندال‌‌های آسیا و اروپا با دو شاخص در دوره 1950- 2010', مجله ژئوفیزیک ایران, 7(4), pp. 31-51. فهیمی, سارا, احمدی گیوی, فرهنگ, مزرعه فراهانی, مجید. بررسی اقلیم‌شناختی بندال‌‌های آسیا و اروپا با دو شاخص در دوره 1950- 2010. مجله ژئوفیزیک ایران, 773; 7(4): 31-51. در این مقاله، بررسی اقلیم‌شناختی پدیده بندال طی یک دوره 61 ساله (1950-2010) در بخشی از نیمکره شمالی، شامل آسیا و اروپا و قسمت شرقی اقیانوس اطلس با به‌کارگیری داده‌های شبکه‌ای NCEP-NCAR صورت گرفته است. با استفاده از دو روش آشکارسازی بندال یک‌بُعدی و دو‌بُعدی، به‌‌ترتیب تعداد 1054 و 729 رویداد بندال در دوره زمانی و ناحیه مورد‌نظر، شناسایی شد. براساس نتایج این بررسی، تعداد رویدادهای بندال این دوره دارای یک روند نسبتاً کاهشی برای کل منطقه مورد بررسی و منطقه ایران است. همچنین توسط این دو روش، یعنی شاخص‌های باریو پدرو و همکاران (2005) و دیااو و همکاران (2006)، ویژگی‌های رویدادهای بندال از قبیل بسامد، طول عمر، محل وقوع، شدت و مراکز آنها بررسی و نتایج ویژگی‌های اقلیمی، با یکدیگر مقایسه شده‌اند. طبق بررسی‌های صورت گرفته، بیشترین وقوع بندال‌‌ها در منطقه مورد بررسی از نظر توزیع مکانی و در همة فصل‌ها، در محدوده طول‌ جغرافیایی E° 5/47 تا °W30 و از نظر وقوع بیشینه شدت‌ها روی شرق اطلس واقع در E ° 5 تا W° 30 قرار دارد. از طرفی، در فصل‌های زمستان و بهار بسامد وقوع بندال و دوره استمرار آن مقادیر بیشتری دارند، درحالی که در فصل تابستان این مقادیر کمینه است. نتایج بسامد وقوع در عرض‌های جغرافیایی و فصل‌های گوناگون نشان‌ می‌دهد که برای شاخص اول، عرض جغرافیایی ثابت همراه با بیشینه‌های بدون تغییر در فصل‌های گوناگون است، اما برای شاخص دوم، این بازه متغیر است و محل بیشینه وقوع بندال‌‌ها در عرض N° 55 در فصل‌های بهار، زمستان و پاییز، و در فصل تابستان با جابه‌جایی به سمت عرض‌های بالاتر، در عرضN ° 5/62 قرار دارد. به‌علاوه، در مقایسه نتایج دو شاخص دیده می‌شود که بندال‌‌های شناسایی شده در بازه طول جغرافیایی با شاخص دوم، دارای درصد بسامد وقوع کمتری نسبت به شاخص اول در فصل‌های زمستان و بهار هستند، حال‌آنکه الگوهای مربوط به دو شاخص در فصل‌‌های تابستان و پاییز تقریبا مشابه هستند. Blocking is one of the most important weather systems in mid-latitudes that have significant effects on atmospheric air flow and regional weather conditions. In this study, climatology of Asian and European blockings was investigated for the period of 1950–2010. The data used in this study were 500-hPa geopotential heights from the National Centers for Environmental Prediction/ National Center for Atmospheric Research (NCEP/NCAR) reanalysis dataset with 2.5°×2.5° resolution. The blocking events were detected using two indices; the first one, a one-dimensional index, was the new version of the Tibaldi and Molteni (1990) index presented by Barriopedro et al. (2005) and the second one, a two-dimensional index, was presented by Diao et al. (2006). Then, applying these indices, the characteristics of detected blockings such as frequency, duration, intensity, position of center and extension were obtained and compared with each other. In the period of this study, 1054 and 729 blocking events were identified using the first and second indices, respectively. The spatial and temporal distribution analysis showed that blocking was most prevalent in the longitude band between 30 °W and 47.5 °E and most of the maximum intensity occurrence was in the east of Atlantic sector between 30 °W and 5 °E. It was found that blocking events were more frequent in the Atlantic-European sector than in the other sectors in winter, spring and autumn, but more persistent in the Atlantic-European sector than in the Asian sector for all seasons. Additionally, the maximum amplitude of intensity was 3.0 for the first index and 150 gpm for the second index. A comparison of the blocking events in the Asian sector with the Atlantic-European sector indicated that the intensity of winter events in the European sector was higher than that of the other seasons. This may be due to synoptic-scale eddies and planetary waves which are more active and stronger in winter compared to the other seasons. The trend analysis displayed that the number of blocking events in the period of this study was decreasing slightly in the entire region, including Iran. The number of events was significantly more in the west and northwest of Iran than in the central and eastern parts. Also, the results of two indices showed that the latitude band of blocking occurrence and its maximum frequency was similar in the different seasons for the first index, whereas this band changed for the second index. The maximum frequency of blocking event was seen in latitude 55 °N for winter, spring and autumn and in latitude 62.5 °N for summer. Thus, it indicated that blockings occurred in a higher-latitude band in summer than the other seasons. In addition, it was found that there was a good consistency between the longitude band of blocking event, including the Asian and European sectors, and its frequency in summer and autumn using the two indices. In the other seasons, the longitude band of the Asian and European blocking events, especially in the eastern part of the Asian sector, was different for the two indices. The other noticeable point was that the activity centers of blocking events in winter, spring, and autumn obtained by the second index were located more westward of the Atlantic-European sector and more eastward of the Asian sector than those obtained by the first index. The main conclusion was that since the Diao et al. (2006) index is a two-dimensional one, it is able to identify better and more precisely the blocking events and their characteristics as compared to the Barriopedro et al. (2005) index. احمدی حجت، م.، 1390، مطالعه دینامیکی و ترمودینامیکی ساختار پُرفشار سیبری و عوامل موثر در تقویت آن در دوره 1948 تا 2008، رساله دکتری هواشناسی، دانشگاه آزاد اسلامی واحد علوم و تحقیقات تهران. احمدی­گیوی، ف.، آزاد، ر. و محب­الحجه، ع.، 1385، مطالعه دینامیکی پدیده بندال با استفاده از تاوایی‌پتانسیل­ شبه‌زمین‌گرد، مجموعه مقالات همایش پیش‌بینی عددی وضع هوا، تهران، 29 آذر 1385. زربو، ا. م.، 1390، بررسی موردی پدیده بندال روی اروپا- آسیا با استفاده از فعالیت موج و شار آن، پایان‌‌نامه کارشناسی ­ارشد ­هواشناسی، موسسه ژئوفیزیک دانشگاه تهران. قرایلو، م.، احمدی­گیوی، ف. و محب­الحجه، ع.، 1385، مطالعه دینامیک سامانه­های چرخندی روی ایران از دیدگاه تاوایی پتانسیلی: مطالعه موردی برای آذرماه 1382، مجله فیزیک فضا و زمین، 32(1)، صفحه 1-13. محب­الحجه، ع.، احمدی­گیوی، ف. و قائمی، ه.، 1374، بررسی بی­هنجاری فشار زیاد مستقر در اروپا و تاثیر آن بر روی آب‌وهوای ایران در اردیبهشت 1371، گزارش نهایی طرح پژوهشی، سازمان هواشناسی کشور. Barriopedro, D., R. Garcia-Herrera, A. R., Lupo, and Hernandez, E., 2005, Climatology of Northern Hemisphere blocking: J. Climate, 19, 1042-1063. Colucci, S. J., 1985, Explosive cyclogenesis and large-scale circulation changes: Implications for atmospheric blocking: J. Atmos. Sci., 42, 2701-2717. Diao, Y., Li, J., and Luo, D., 2006, A New Blocking index and its Application: Blocking Action in the Northern Hemisphere: J. Climate, 19, 4819-4839. Elliott, R. D., and Smith, T. B., 1949, A study of the effects of large blocking highs on the general circulation in the Northern Hemisphere westerlies: J. Meteor., 6, 67-85. Green, J. S. A., 1977, The weather during July 1976: Some dynamical considerations of the drought: Weather, 32, 120-126. Lejena¨s, H., and Økland, H., 1983, Characteristics of Northern Hemisphere blocking as determined from a long series of observational data: Tellus, 35A, 350-362. Luo, D., 2005a, A barotropic envelope Rossby soliton model for block-eddy interaction. Part І: Effect of topography: J. Atmos. Sci., 62, 5-21. Lupo, A. R., and Smith, P. J. 1995, Climatological features of blocking anticyclones in the Northern Hemisphere: Tellus, 47A, 439-456. Rex, D. F., 1950b, Blocking action in the middle troposphere and its effect upon regional climate. Part II: The climatology of blocking action: Tellus, 2, 275-301. Shutts, G. J., 1983, The propagation of eddies in diffluent jet streams: Eddy vorticity forcing of blocking flow fields: Quart. J. Roy. Meteor. Soc., 109, 737-761. Tibaldi, S., and Molteni, F., 1990, On the operational predictability of blocking: Tellus, 42A, 343-365. Wiedenmann, J. M., Lupo, A. R., Mokhov, I. I., and Tikhonova, E. A., 2002, The climatology of blocking anticyclones for the Northern and Southern Hemisphere: Block intensity as a diagnostic: J. Climate, 15, 3459-3473.